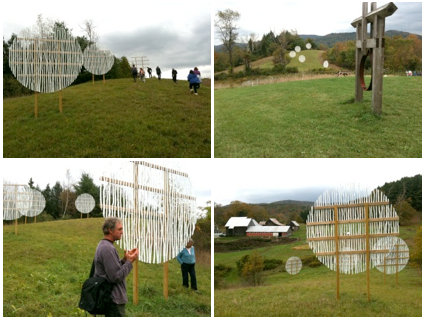 In late September, I brought a combined group of 18 sculpture and “green art” students from Woodstock High School to my installation “When the Moon Came to Earth” at King Farm. I taught them about what artists are looking to express in sculpture and how the landscape and other sculptures come into play as well. I also spoke about my creative process. The “green art” students came back several times to eventually create their own installations, which I returned to see with them present. Thanks to friend and artist, Blythe Ousterman, for the above photos.